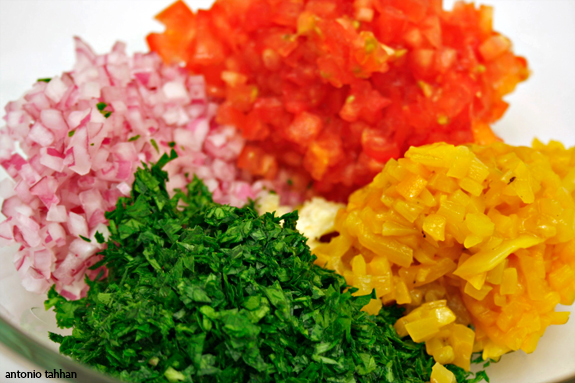 Posted in appetizers, recipe, savory, Spanish by Antonio Tahhan on June 9th, 2009. You can follow any responses to this entry through the RSS 2.0 feed. You can leave a response, or trackback from your own site. I know what you mean. I move a lot and it’s worse every time. I hope that this summer will be my last move in a while. Great dish you made. Love the pics! Mmmmm, those look amazingly good! So fresh and definitely summery. Love the new space … may you use it in good health. Congratulations on the new place…hope you’re enjoying Annapolis. Beautiful photos, as always. I may try your vinagreta on some oysters. Happy breakin into your new home!Hope it will bring you lots of love, luck and happiness.. I too understand the feeling too well,and have moved around a bit ”too” much at this point! Where did you move to? Still in upstate? 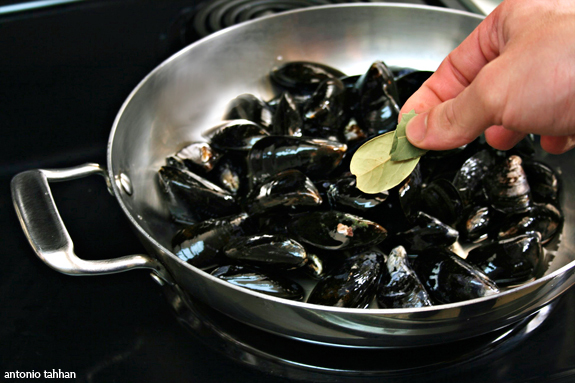 Tony, the empty mussel shells says it all…mucho delicioso! 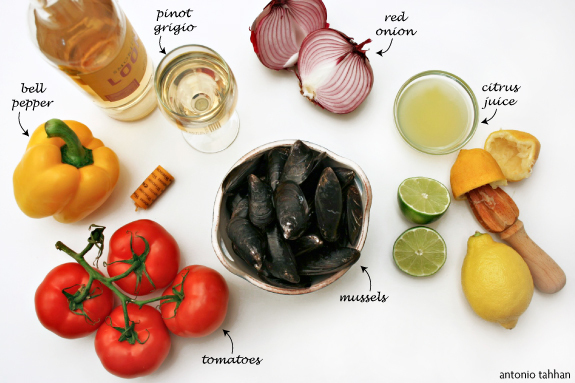 I’ve yet to encounter a mussels dish I didn’t like…pretty, tasty and cheap. Happy to have you back between us my dear. Nakleh Mbarkeh….. Inshallah Kheir wa Faraj. p.s. 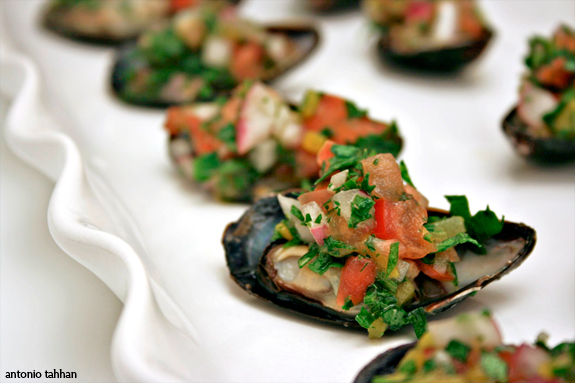 : Have you ever prepare the Lebanese BBQ Clams??. I’ve never made them into a pasta sauce, but that sounds superb for when the weather starts to cool down a bit. 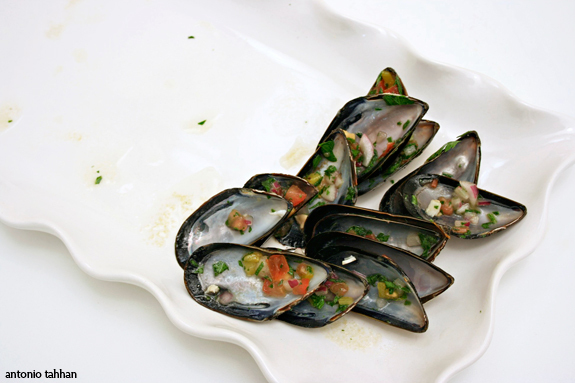 and I haven’t had Lebanese BBQ clams – do you have a recipe for them? These looks Phenomenal!!!!! The ingredients looks so fresh, Awesome Job! 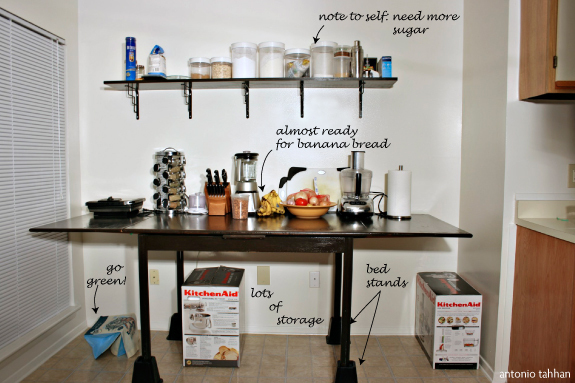 I like your new kitchen and your homemade counter!! very creative and clean looking. the recipe is so so simple and looks very delicious…thank you always for sharing your life and recipes on your blog, great job!